Bygone Borderlands was a concept and an event which was initiated by the Berwick Record Office in 2003 as part of Berwick’s celebration of the 400th anniversary of the Union of the Crowns. The aim was to bring together local and family history groups on both sides of the Border so that they could showcase their own community and give the general public the opportunity to find out more about them. Over the years similar weekends had taken place in Berwick but on a low key basis. However, as the Flodden Project was crossborder, it seemed very appropriate to organise another event in the period leading up to the commemoration. Various local history and family history groups on both sides of the borders were contacted and a Bygone Borderlands weekend was held in Berwick Town Hall on 17th and 18th May 2013. The participants included Coldstream Local History Society; Tillvas; Lowick Heritage Group; Glendale History Society; Ayton Local History Society and Border Archaeological Society. They all prepared displays on their own communities and manned them over the weekend. As well as the displays, there were a series of talks held in the Council Chamber on subjects ranging from Women at Flodden; James IV – a composer to Mauchline ware and Flodden. Over 1400 people attended the event during the weekend and it was a great start to the Flodden Project, giving the public a chance to find out about the fascinating history of our area; allowing local groups to meet and swap contacts and most importantly raising the profile of the Battle of Flodden and our project. In 2014 Bygone Borderlands took place on the Scottish side of the Border for the first time. 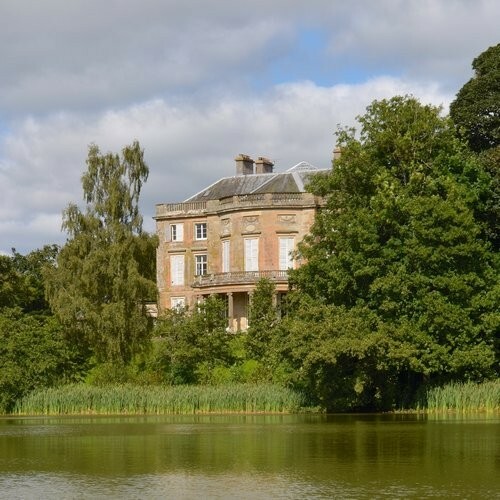 The venue for the event was the Haining in Selkirk, a Palladian style house dating from the 1790s. 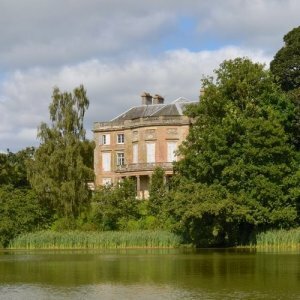 The house owned by various families over the years, was bequeathed to the people of Selkirk in 2009 and is run by the Haining Charitable Trust. The house provided a visually stunning setting for the event, situated overlooking the loch in the grounds. For much of the weekend the weather was fine and visitors were able to make the most of the stunning setting. For a full two days people turned up to the house for a programme of talks, educational activities and live music as well as a selection of stalls from local traders and historical societies. As well as teas, coffees and cakes there was the opportunity to purchase hot rolls from Lindsay Grieve, the noted Hawick butcher. Day one contained a full programme of talks and musical entertainment. The programme broadened out from the theme of Flodden to look more generally at remembrance and local history. To give a flavour of the day’s content Dr David Welsh opened proceedings with his talk “Truth & Fiction: the role of the archive in reclaiming Border history from the Border past.”, Lord James Joicey followed with the introductory talk “What is the Flodden 1513 Ecomuseum?” Chris Burgess finished the first day’s talks with “James Wis Robbed – Examining the failure of James’ tactics and strategy at Flodden”. A variety of musical entertainment was provided throughout the weekend with performances by Riddell Fiddles and the Selkirk Pipe Band as well as a performance of Border Ballads and Tunes by Kathy Hobkirk, Elsa Le Maitre, Matt Seattle and Bill Telfer. The second day presentations continued on similar theme. Chris Bowles opened the day’s proceedings with “What We Remember and What We Forget: Memories Preserved in Scottish Borders Archaeology” and Alistair Bowden concluded with “Flodden: a story reaching back 500 million years”. Between these talks Selkirk’s renowned local historian and expert, Walter Elliot hosted a Q&A session sharing stories from his many years of research and Paul Brough of the Scottish Borders Archive spoke on “The Unselfconsciousness of Archives”. The weekend included various crafts and activities. There were opportunities to try quill writing and also to prepare various crafts such as 3D landscapes, felt horses and battlefield bunting. The colourful Flodden horses made by Selkirk Primary Schools, working with the Flodden education team, were also displayed on this site. One of these has now taken up permanent residence at the Heritage Hub and we have named him “Souter” owing to his place of origin! One room was designated for remembrance with a particularly poignant display from Jedburgh Grammar school pupils themed around their visit to Auschwitz. In a weekend commemorating military campaigns of the past reflecting on the impact of modern day warfare also seemed particularly relevant. Over the two days over 900 people passed through the Haining’s gates and sampled what was on offer. The events were open to all the family and attracted a wide range of people from the locality and further afield. It was a privilege to have the opportunity to bring the Bygone Borderlands brand to the Borders so successfully established by Berwick Archives.